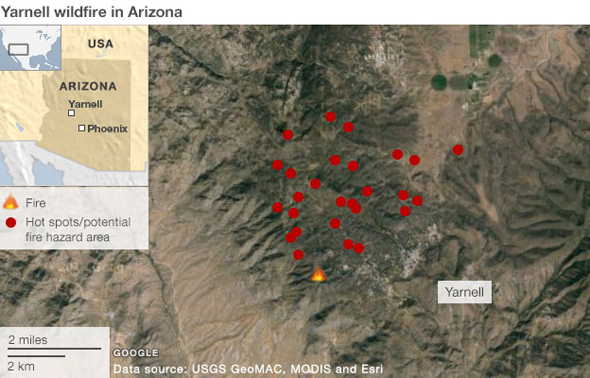 Arizona wildfire near Yarnell kills 19 firefighters At least 19 US firefighters have been killed battling a wildfire in central Arizona, local officials say. "> At least 19 US firefighters have been killed battling a wildfire in central Arizona, local officials say. At least 19 US firefighters have been killed battling a wildfire in central Arizona, local officials say. They died while fighting the blaze threatening the town of Yarnell, about 80 miles (130km) north-west of Phoenix. 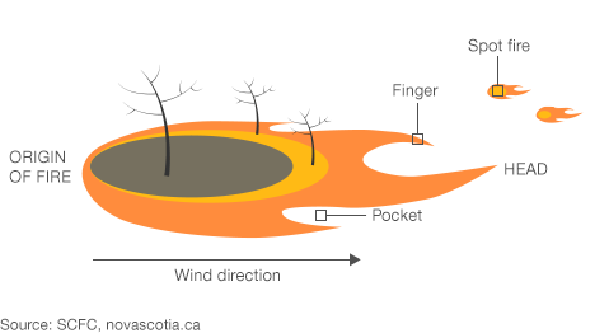 The fire was started by lightning on Friday and has spread rapidly to 2,000 acres (800 ha) amid high heat, low humidity and strong winds. Arizona and other parts of the western US - including California - had near-record temperatures over the weekend. It is the highest death toll for firefighters in a single incident since 9/11. "We are heartbroken about what happened," US President Barack Obama said in a press conference in Tanzania on Monday. Earlier he called the deceased firefighters heroes. Arizona Senator John McCain said the families of the dead firefighters were in the thoughts and prayers of all Americans. "This devastating loss is a reminder of the grave risks our firefighters take every day on our behalf in Arizona and in communities across this nation. Their sacrifice will never be forgotten," he said in a statement. Arizona Governor Jan Brewer said it could take "days or longer" to reveal how the deaths occurred. "This is as dark a day as I can remember," she said. The Prescott, Arizona, fire department has confirmed to the BBC that 19 of its firefighters were killed in the blaze. 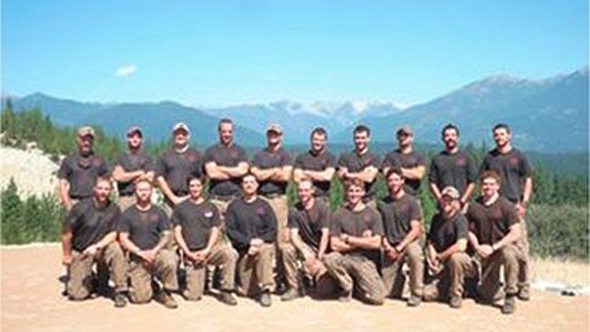 The dead firefighters have been identified as members of an elite unit called the Granite Mountain Hotshots. The crew had battled other wildfires in New Mexico and Arizona in recent weeks, officials say. They were forced to deploy emergency tent-like structures meant to shield them from flames after becoming trapped and "something drastic" happened, said Dan Fraijo, fire chief in the nearby city of Prescott. "One of the last fail-safe methods a firefighter can do is literally to dig as much as they can down and cover themselves with a protective fire-resistant material, with the hope that the fire will burn over the top of them and they can survive it," he said. "Under certain conditions there's usually only sometimes a 50% chance that they survive. It's an extreme measure that's taken under the absolute worst conditions." Dwight Devlin from the Arizona Sheriff's Office told the BBC that the firefighters were carrying fire blankets but they were ineffective in this case. "Some were actually found with those blankets over them but unfortunately it appears the flames and the heat were too much," he said. Mr Devlin added that they were on their way on foot to an area where they had been directed to clear brush to prevent the spread of the fire. The tragedy is the worst in a wildfire since 1933, when at least 25 firemen died battling a fire in Griffith Park, Los Angeles. Some 250 firefighters are still battling the fast-moving wildfire. An additional four specialist hotshot crews of about 20 people each are being deployed. The blaze has forced the evacuation of local residents. An estimated 200 homes were destroyed in Yarnell, the Associated Press reported, about half the properties in the town. In recent days, dozens of people across western US states have been treated for exhaustion and dehydration, as the heat wave continues. Temperatures in some areas were expected to reach 54C (130F), close to the world's all-time high recorded 100 years ago in California's Death Valley.